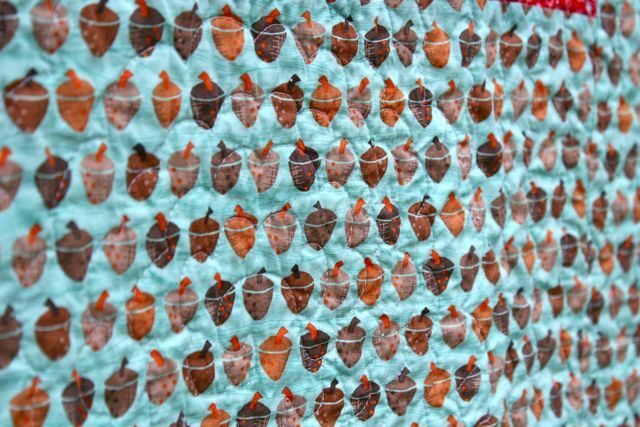 I’ve decided to call this quilt Organic Acorns, after playing with some other ideas. 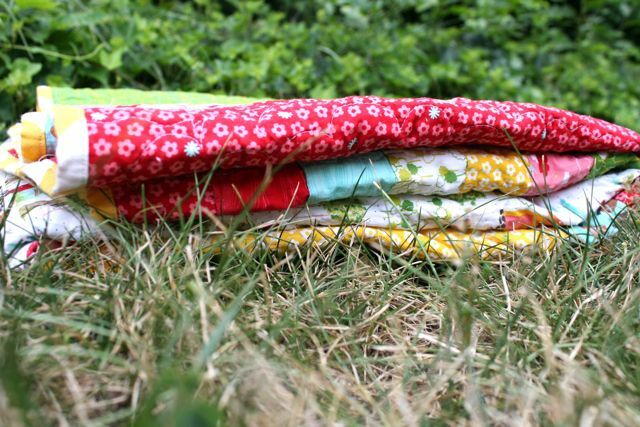 I really enjoyed sitting down with this half yard bundle and not thinking too much, just laying the fabric on the floor and using giant chunks and smaller chunks and seeing what happened. If a piece was too short, I added a bit; if it was too long, I lopped it off; and I moved bits around until I was satisfied. It’s still pretty rectolinear, and doesn’t have any wonky lines, but the process was such an easy, unplanned one that the “organic” name seems to fit. The back was the same process: I had a couple yards of the acorn print and knew I wanted to use it for the backing, and then simply filled in with the smaller bits left over from the front in order to get to the right size. Easy, peasy. No matter how long I look at it, the yellow continues to be my favorite part. It’s just the right shade of yellow, obviously. 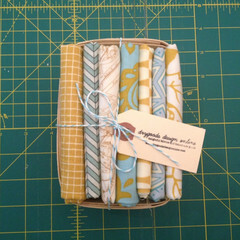 And so I picked up on that and used a yellow chevron print from Moda for the binding. 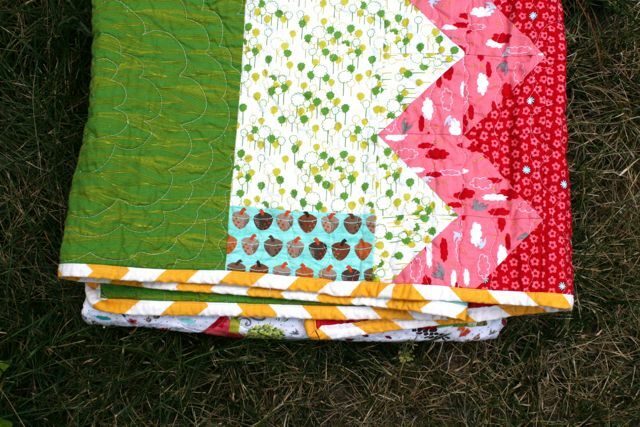 In some ways, I can see that using a chevron that way was a waste–you can’t even tell it was chevrons and not stripes–but I love that the angles change over the body of the quilt, and the color was so perfect. Plus, so much of this quilt is large pieces of fabric that the white balance with the yellow seemed just right for the binding. 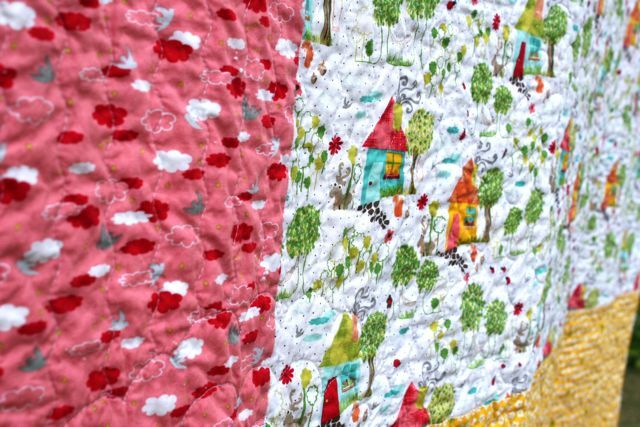 Somehow, just that little splash of extra yellow on each edge makes the whole quilt so cheerful and sweet! 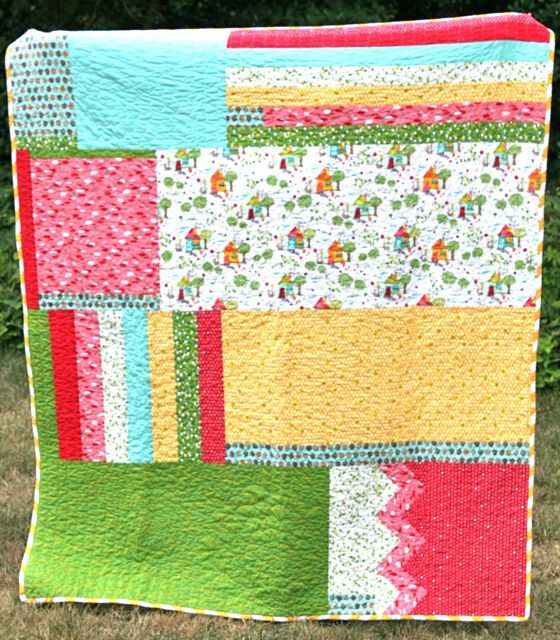 For the quilting, I knew I wanted to try a couple different things, but couldn’t decide which: either a large, chrysanthemum-y floral design or a wavy line, both of which I’d seen recently and was super intrigued by. And then I had a brainstorm: why not use both, together? Part of me thought that might be too much and overwhelm, and then I decided, “Big deal.” And I love how it turned out. For the flowers, I used the Flower Power design from Angela Walters‘ new book, Free-Motion Quilting. So easy to do, and you can make the flowers any size you choose! It was fun to see how the smaller ones, in groups, varied from the biggest ones, which I let just grow and grow and grow. For the wavy lines, I used my walking foot and the #4 stitch on my Bernina, stretched out to the longest stitch length. Very simple, even if all the stopping and starting to make the lines appear to lie behind the flowers was a little tedious. It has already been washed and dried and is super crinkly and fabulous. Note to self, though: be sure to trim ALL the bits of thread before putting it in the wash next time–what a tangled mess all those missed threads became! I had to lay out the wet quilt between the washer and dryer and go back and get the ones I hadn’t caught the first time around, and it was such a pain. One of my favorite parts now, as I get to stand back a bit and look it over, is these bits and pieces that surprise me, where I had smaller leftovers and just used them whole in random places. 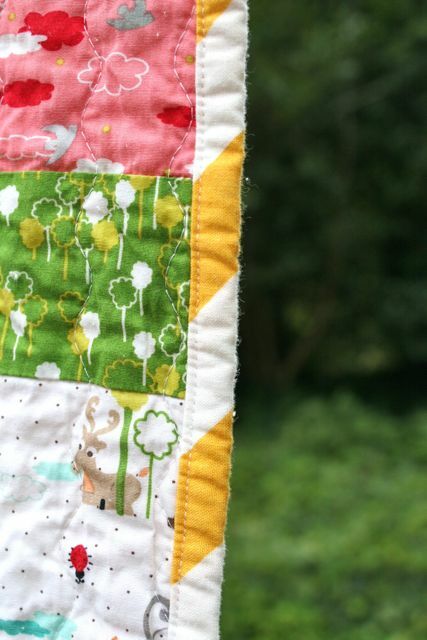 So fun to find little treasures like that tucked away in spots around the quilt. And who could ever get enough of these acorns?? I think I have mentioned before that my graduate thesis was an experimental analysis of acorns as a staple food stuff in the prehistoric Southeastern United States. (And it was every bit as fascinating to read as it sounds, I can assure you.) So acorns–and by extension, oaks and squirrels–have become a recurring symbol around my house. 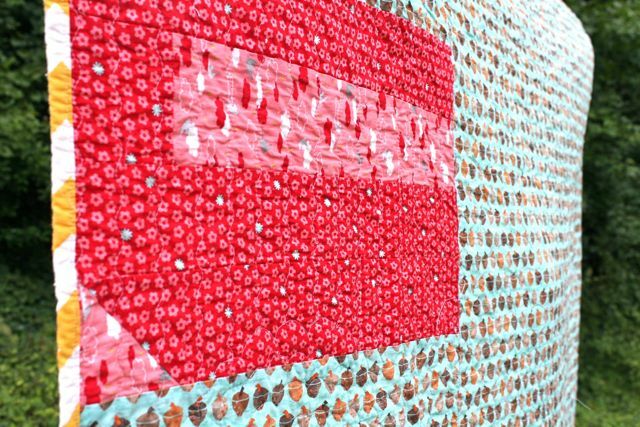 This quilt is for ME and me alone–first time I’ve been able to say that! 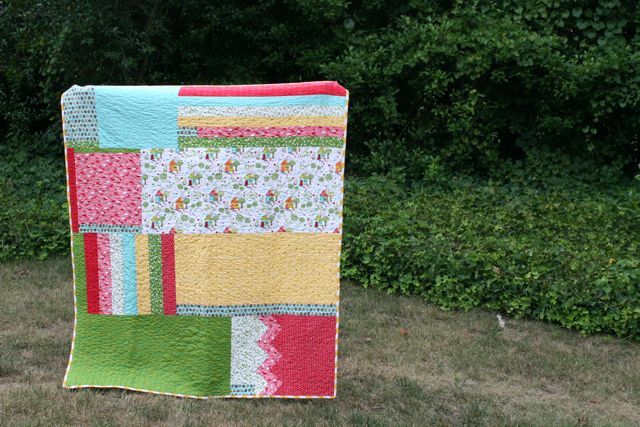 See how great that yellow is along the edge, and how it makes all the colors in the rest of the quilt pop? 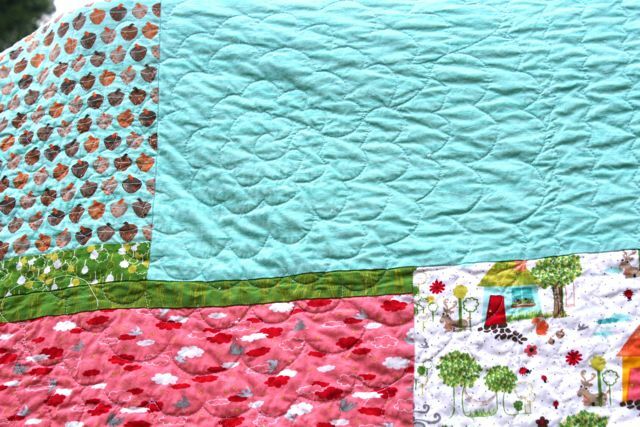 I love the quilting step the best, but I suspect that my true gift when it comes to making quilts lies in choosing the binding–it’s the one part where I usually feel really confident and pleased about my selections. A bit of an odd super power, but there it is, all the same. I meant to finish this whole project when we were away at the lake last week for the Fourth, but after packing and dragging all my supplies plus my machine, I discovered I had left my power cord and foot pedal behind. Such a rookie mistake! 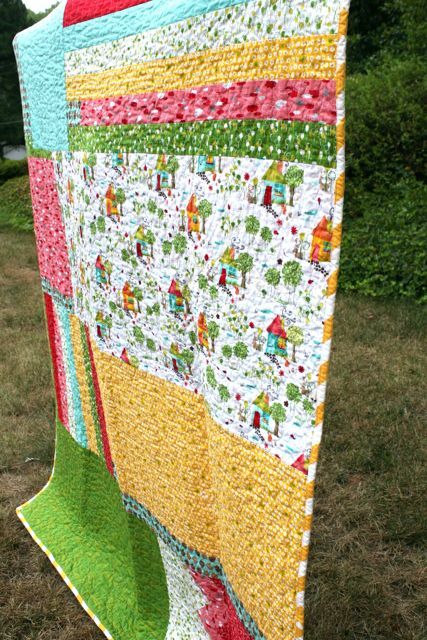 And a total bummer, since I was really looking forward to having this quilt to lounge upon while we were there. Ah, well. The hammock was just as good. What was the last project that YOU made just for you and only you? 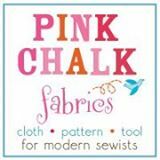 The last time you jumped in and just started sewing without over-thinking or planning it a whole bunch? 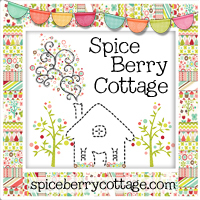 I hardly ever let myself do that–what a relaxing project this was. 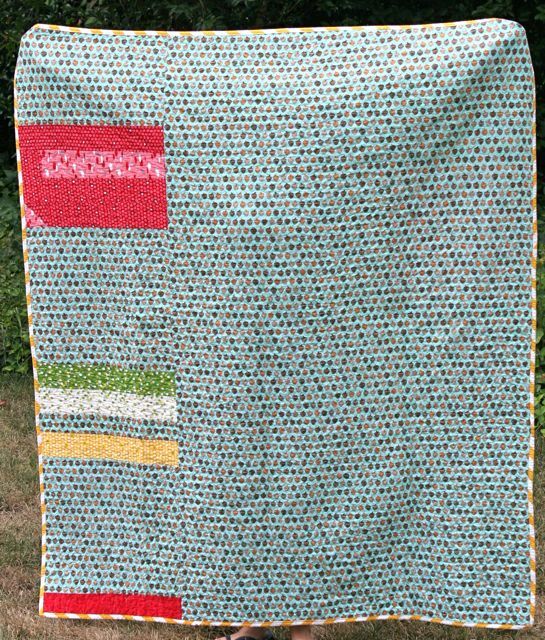 And I think that the feeling I got while making it will stick with it–my new relaxation quilt. Woot! 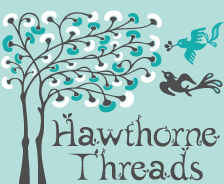 ← Come to Whipstitch for a Book Signing with Dana of MADE! Binding choosing is a super power quite to be desired! 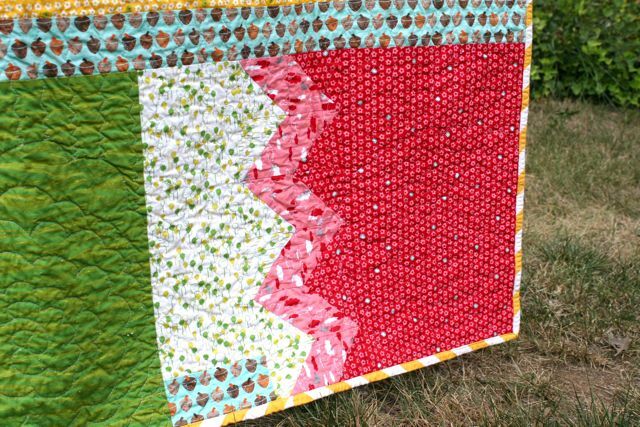 Though, right now I’d take quilting super power please. I think you’ve named the quilt perfectly. It sounds like it was a wonderful, relaxing organic process. Such a treat! 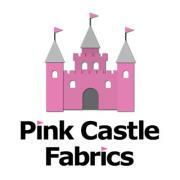 And, yes, it is a pretty mix of fabrics and colors. Good to know about your acorn thesis. That info is sure to come in handy sometime. I’ll know I can always get you involved in a project if I interject an acorn motif. Hmm… Hm…. did u use a regular sewing machine…or a long arm? I am new to quilting and only have done tiny things. Hand quilting a large quilt, but longing for how to do it on my old machine.